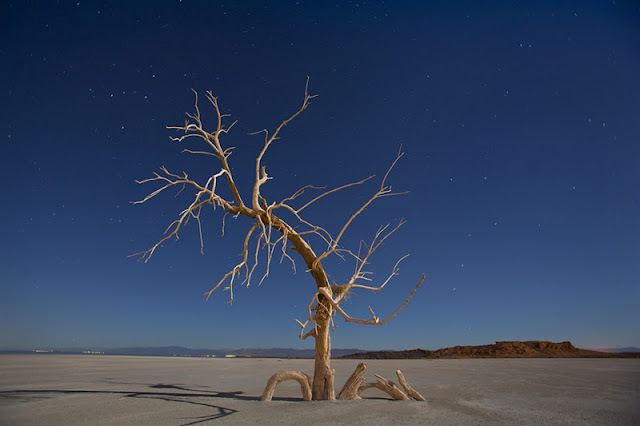 A dead oak tree glows under a full moon in a salt pan on the southern end of the Salton Sea near Niland, California, USA.Erosion and high toxicity levels from farm runoff has left the Salton Sea increasingly contaminated, and lake-side towns all but deserted. 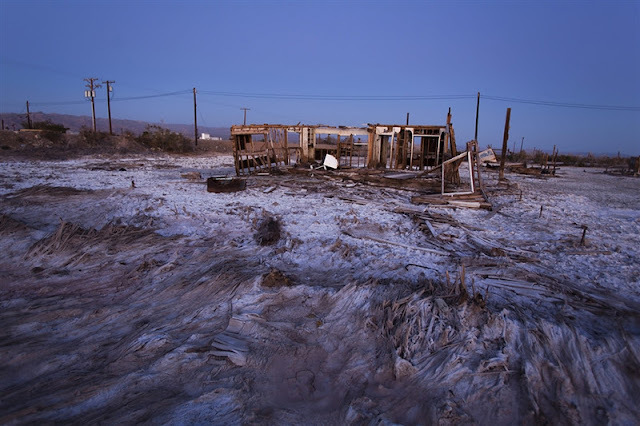 An abandoned building sits in a salt pan near Bombay Beach, California.Erosion and high toxicity levels from farm runoff has left the nearby Salton Sea increasingly contaminated, and lake-side towns like this one all but deserted. 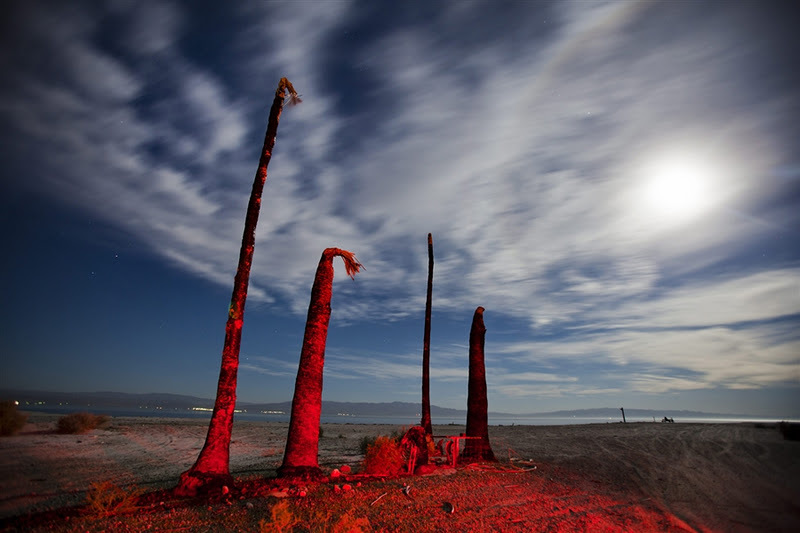 The trunks of dying palm trees rise from from the shores of Salton Sea Beach, California.Erosion and high toxicity levels from farm runoff has left the Salton Sea increasingly contaminated, and lake-side towns like this one all but deserted. 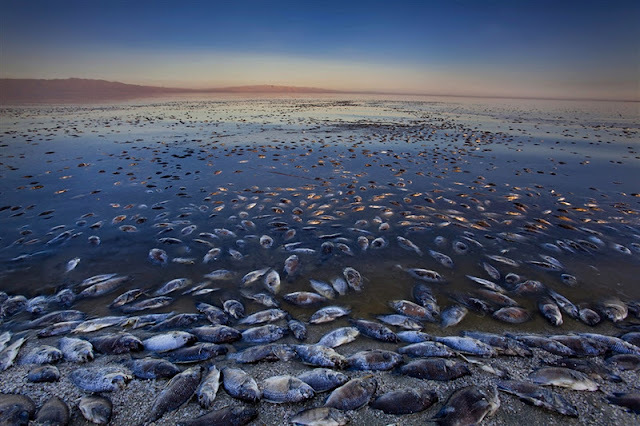 Dead tilapia float in the Salton Sea near Salton Sea Beach, California.Erosion and high toxicity levels from farm runoff has left the Salton Sea increasingly contaminated, causing massive fish die-offs, and lake-side towns to become all but deserted. Deep in the desert of southern California sits one of the worst environmental sites in America, a former tourist destination that has turned into a toxic soup: the Salton Sea. The sea was born by accident 100 years ago, when the Colorado River breached an irrigation canal; for the next two years the entire volume of the river flowed into the Salton Sink, one of the lowest places on Earth. The new lake became a major tourist attraction, with resort towns springing up along its shores. Yet with no outflow, and with agricultural runoff serving as its only inflow, the sea’s waters grew increasingly toxic. Farm chemicals and ever-increasing salinity caused massive fish and bird die-offs. Use of the sea for recreational activities plummeted, and by the 1980s its tourist towns were all but abandoned. The skeletons of these structures are still there; ghost towns encrusted in salt. California officials acknowledge that if billions of dollars are not spent to save it, the sea could shrink another 60 percent in the next 20 years, exposing soil contaminated with arsenic and other cancerous chemicals to strong winds. Should that dust become airborne, it would blow across much of southern California, creating an environmental calamity. 4 responses to "Contaminated Salton Sea"
pathetic. what the hell are we doing to this planet? take a good look at those fish, because eventually that will be us. An example of how man is killing himself.